Simmons Homestead Inn is in the best of all worlds and should be your favorite bed and breakfast inn on the Cape! 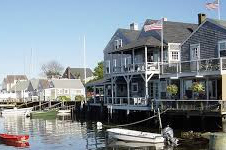 We are in Hyannis Port a half mile out of Hyannis and less than 2 miles from the best Hyannis attractions, the great beaches, entertainment, restaurants, ferry boats for day trips to Nantucket and Martha’s Vineyard and just about every Cape Cod attraction you want to enjoy. The center of Cape Cod is right here in Hyannis Port. Simmons Homestead Inn has planned and laid out what to do and what to see. We have 6 pages of handouts and a bunch of maps for the Cape alone. There are also handouts and maps for both Nantucket and Martha’s Vineyard, which are fun day trips, and we have ferry discount coupons too. 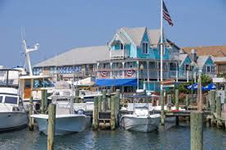 You need several days to just see the Cape, so the longer you can stay the more enjoyment you will have; and our room rates also drop the longer you stay. 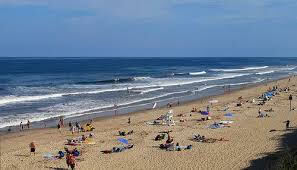 The Cape Cod is very special all year round and you will want to come back several times a year and year after year. 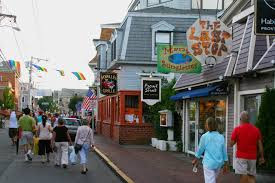 The Cape is a great place to come in summer of course, but it has lots going for it year round, especially here in Hyannis Port – in the dead center of the Cape on the Ocean side – Cape Cod attractions abound. From here to either end of Cape Cod is a half an hour and another half an hour all the way to the tip. The Inn is a half-mile to the Ocean in one direction and a half-mile to Hyannis in the other direction. The Harbor where there are ferryboats to both Nantucket and Martha’s Vineyard is two miles away. Probably half the best restaurants on all of Cape Cod are within 5 miles of the inn. The Simmons Homestead Inn is the best of all worlds, and should be your favorite Cape Cod bed and breakfast! Sit out on the back porch at Wine Hour or in a hammock in the backyard looking towards Simmons Pond, and you think you are a thousand miles away from the world. 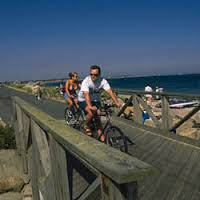 Cape Cod bike trails surround the Simmons Homestead Inn, and we have a shed full of bikes and helmets you can use free. Bicycle guides to nearby trails are here for you to take. Special booklets, handouts, maps given out, so you can get maximum fun out of cycling on the Cape. Serious peddlers who bring your own bikes will get the same handouts and maps, of course. We have about a dozen bikes, including smaller ones for kids, that you can borrow to go to the beaches or into town or just to ride along the harbor and see why Cape Cod trails are so cool and relaxing. For serious biking, we have a couple of bike carriers you can attach to your car or SUV and head out to the many trails that start at our back door. 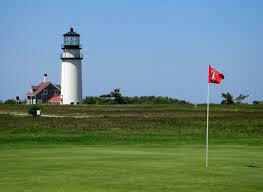 Golf fanatics head to one of the top golf destinations with more than 50 Cape Cod golf courses to choose from. Simmons Homestead Inn is right down the street from not one, but two golf courses on Scudder Avenue in Hyannis Port. Local golf courses include public, semi-public, country club, and private golf courses. If you belong to a golf club, have your Pro call the Pro at Hyannis Port Club or any other great private club and you can usually get a guest pass. Cape Cod beach-goers will find toy chests in both buildings loaded with towels. Out in the Bike Shed there are light-weight beach chairs, umbrellas for the sun, buckets, shovels and more for the kids, or bored husbands. Town beaches on Cape Cod charge for parking (a good reason to walk to nearby beaches), but they do have restrooms and snack bars. Local and town beaches within a half mile are walkable and free.The National Seashore starts about 30-40 minutes from here and is great. Local beaches are flat. The Seashore has big dunes down to the beach and also places you can take a dog year round. We have several Styrofoam coolers you can borrow to take to the beach or out by the hammocks in the backyard. These islands make good Day Trips and ferries leave right out of Hyannis Harbor 2 miles from the Inn. We have handouts on what to do and see and maps and discount coupons for the Hy-Line Ferries. This is another reason to stay 4-5 days so you can see the Cape and still have time to tour an Island. Another reason for staying at the Simmons Homestead, which is dead center on the Cape and on the Ocean.